TELL US ABOUT THE ORIGINS OF P2P. SO I UNDERSTAND P2P HAS OFFICES AROUND THE WORLD? WHO HAS BEEN YOUR GREATEST SUPPORT AND INSPIRATION? WHERE DOES YOUR FUNDING COME FROM? HOW DOES P2P WORK TOWARD RECTIFYING THE STIGMA OF AIDS? HOW HAVE YOUR CORPORATE SPONSORS HELPED? I UNDERSTAND P2P ALSO SPONSORS A SCHOOL FOR GIRLS. Ethiopian-born Enawgaw Mehari, MD, came to the US in 1995 to fulfill his dreams of becoming a neurologist, enrolling in the University of Kentucky for a neurology residency. But he never forgot the medical turmoil in Ethiopia after moving to the US. In 1999, while wrapping up his residency, he founded People to People USA (P2P), a nonprofit organization that aims to improve health care and reduce AIDS in Africa, particularly in Ethiopia. After graduating, he began practicing neurology with specialties in pain management and neuro-AIDS at the Morehead Clinic and St. Claire Regional Medical Center in Kentucky, where he is now chief of the neurology department. He has since expanded the services of P2P, including opening the People's Free Clinic in Morehead, KY, in 2005 for the working poor who have no health insurance — an estimated 500,000 — and a clinic online for anyone anywhere in the world. In 2006 Dr. Mehari won a distinguished services award from the Society of Ethiopians Established in the Diaspora, and in 2007 he was nominated as a CNN Hero, awarded by the cable network to everyday people around the globe who have made a major impact on the world. In 2008, P2P and Dr. Mehari were officially honored and presented with a Certificate of Recognition by the Senate of the Commonwealth of Kentucky for his work in Morehead and Ethiopia. Dr. Mehari spoke with Neurology Today about his dedication to P2P and the organization's strong outreach programs. P2P USA was founded as a non-governmental, nonprofit organization to improve health care and reduce the spread of HIV/AIDS in Africa, particularly in Ethiopia, and diaspora communities in the US. There are currently about 5,000 members worldwide. The membership is free and open to anybody — doctors, nonprofessionals — who want to make a difference in the lives of the people. You can go to www.peoplepeople.org and become a member. P2P has now become international, with headquarters in the US and Ethiopia (a focal point of all the satellites in the world), Canada, Sweden, Finland, Tanzania, Sudan, Somaliland, and Australia. In 1999, chapters were formed in Sweden and Canada, followed by Ethiopia and Finland. In 2002, P2P established an international discussion forum on health matters, and currently there are about 2,500 active members from all over the globe who participate in the discussion every day, sharing their viewpoints and posing questions. I was inspired by the challenges of medical care in Ethiopia. I witnessed firsthand the families torn apart and children orphaned by AIDS. My wife and my kids have been my greatest support, and Dr. Joseph Berger, the chair of neurology at University of Kentucky, has been an immense source of energy and helped me to believe nothing is impossible. Funding is always a challenge, and our resources don't match our needs. Sources of our funding include Pfizer, the NIH, the National HIV/AIDS Prevention and Control Office, the Stephen Lewis Foundation, Ethiopian Air Lines, Canadian Embassy in Ethiopia, World Bank, and the Packard Foundation. We also survive by public donations and individual support. We work with anti-AIDS clubs in communities that organize students to perform AIDS awareness dramas that educate and amuse schoolchildren, and develop education programs for high school students about HIV transmission and prevention by addressing behavioral change and life values. P2P emphasizes that it is wrong to discriminate against people based on their diseases, and that we cannot close our ears and eyes to the challenges of patients with HIV/AIDS, especially in Africa where the epidemic is so prevalent. In 2005, Pfizer Foundation graciously responded to P2P's request to freely supply fluconazole, a potent antifungal drug, to the Ministry of Health in Ethiopia to distribute to AIDS patients for an unlimited amount and time. This drug is not easy to acquire in poor countries where AIDS and complicating infections often occur. TELL US ABOUT THE P2P SPONSORSHIP PROGRAM FOR ETHIOPIAN CHILDREN ORPHANED BY HIV/AIDS. More than a million children have been orphaned by HIV/AIDS, and that number is growing. In collaboration with two other nonprofits the Dawn of Hope and the Association of People with HIV/AIDS in Ethiopia, P2P USA and P2P Canada have helped over 400 orphans in Ethiopia through a sponsorship program that covers the immediate needs of a child, including schooling, and supervision by Ethiopian organization staff and volunteers. Sponsors fill out a form on the Web site and send a $20 (US dollars) monthly per orphan to the Orphans Sponsor Program at the P2P US headquarters. The money is wired to an account in Ethiopia, where payments are made to guardians of selected orphans. Yes, we established a boarding school for girls (AIDS orphans) who are in very good academic standing in Amanuel, in eastern Gojjam, Ethiopia. In 2006, we helped establish a neurology fellowship training program, and we continue to review curricula for post graduate training. Our Horn of Africa Journal of AIDS is the first regional, scientific, peer-reviewed journal devoted to HIV/AIDS, published biannually and distributed free of charge to the medical community in Ethiopia and in East Africa. We have also designed a training workshop for physicians in Africa on the basic concepts of hospice and palliative care philosophy. I led a group of physicians and nurses from Morread, experienced in hospice care, to participate as trainers in Addis-Abeba, Ethiopia. For more information on People to People, please visit www.peoplepeople.org. The P2P discussion forum can be accessed at http://health.groups.yahoo.com/group/People_to_People_Forum/. 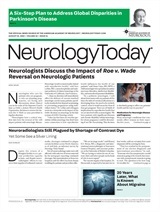 Neurology Today8(21):20-21, November 6, 2008.